Enjoying a nice weekend barbeque or just a spot to relax in the evenings sounds amazing, doesn’t it? A beautifully designed patio will give you just that, a spot all your own to enjoy a friendly party or a quiet conversation with loved ones on a romantic evening. The problem with the most patios is that they are open, missing a cover or shade that will create just the perfect setting for you. When you decide to create a cover for your patio, it can be a daunting task to choose the right material to fit your needs and last long. In the market there are many options to select the right patio roof materials for your home outdoor. The material must be strong and durable enough to withstand extreme weather conditions. Try contacting Royal Covers for the best patio cover installation available. Now let us get into the materials that are actually available for patio covers. From all the patio roof materials available, wood provides the most pleasing aesthetics. In fact, it’s difficult for any other material to beat the appeal that wood offers. In addition, wood patio covers are durable and strong, although this will depend on the type of wood you choose. Hardwoods such as oak will offer far more durability. Another benefit is the wide range of natural textures and colours to choose from in the wood department. This means that regardless of your patio design, you’ll still have something to that will work. While wood offers some outstanding benefits, you’ll also have to deal with some negatives. For example, wood patio covers are more expensive than other materials. You will also need to maintain the wood through sanding and painting over a time. If you’re looking for a lightweight and sturdy cover material for your patio, then aluminum is your best bet. Thanks to its sturdy nature, you don’t have to disrupt your Sunday nap out on the patio due simply to a strong wind. Among the patio roof materials, this material is expensive, its durability more than compensates for its price. Furthermore, you won’t experience rotting, cracking or warping like you may see with wood. Aluminum patio covers are available in many styles and colours. An advantage of aluminum patio covers in general is that, the bugs are not attracted to them! However, aluminum’s main drawback is heat retention. Remember, aluminum is a type of metal and metals conduct heat. Therefore, you may feel rather uncomfortable while under this type of cover, especially during the warmest seasons. Note: The most material used nowadays is the Alumawood Patio Cover in the market. It is strong and lightweight similar to aluminum panels. Basically, this alumawood patio cover is an aluminum that has been embossed, painted and manufactured into shapes that resemble wood. The finished product is beautiful and have low maintenance. Also Read: WPC Board (Wood Plastic Composite) – Things You Need To know!!! Vinyl screams low maintenance when it comes to patio covers. If you don’t want anything to do with sanding or repainting, then vinyl ticks these boxes. In fact, there’s high quality vinyl in the market that beats wood. No rotting, cracking or warping. Homeowners often choose a vinyl patio covers, because they are not expensive and its installation is quick and easy. If you are looking for a patio cover to shade your driveway to protect car from the heat, then the acrylic patio covers will work out as a good option. If aesthetics takes center stage when selecting a cover material for your patio, then vinyl may fail terribly, in fact. What’s more, many consumers report fading over time and the limited colour variety can be problematic. A custom (fabric) canvas patio cover is an excellent way to increase the weather-protected usable space at your home or office. Canvas patio cover structures are always designed to complement the existing architecture. The fabrics used for outdoors are PVC (Poly Vinyl Chloride) coated polyester cloth and PTFE (Poly Tetra Fluoro Ethylene) coated glass cloth that provide you protection from the sun and its harmful UV rays, as well as rain. Tensile Sail shades are an especially creative way to cover your patio, because they provide endless possibilities. (A shade sail is a device to create the outdoor shade based on the basic technology as the ship’s sail. Shade sails use a flexible membrane tensioned between several anchor points.) You can experiment using these tensile sail shades with multiple colours and configurations to ensure you with the unique patio cover for your home. Polycarbonate is a light weight material and are tough enough that they can undergo much stress without cracking or breaking. As a thermoplastic material, they can withstand extremely low and high temperatures, making it practical and durable roofing choice for your patios. 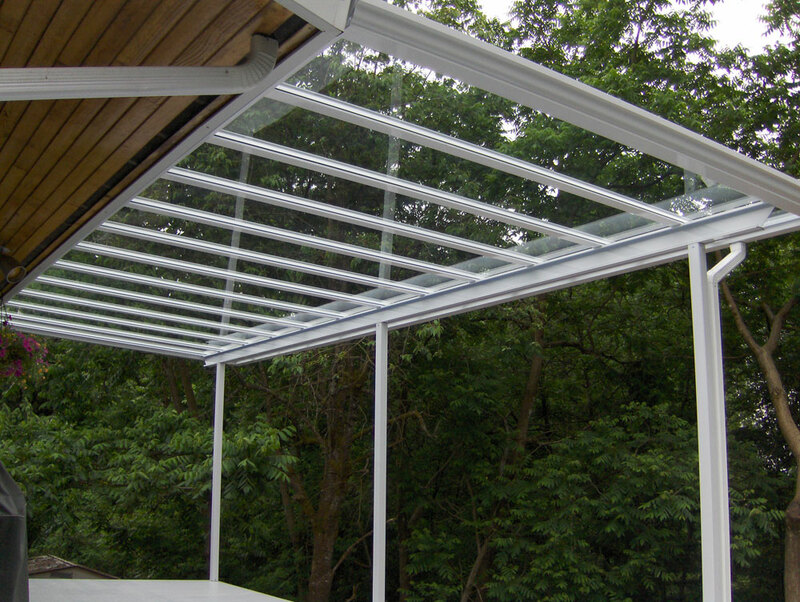 Polycarbonate patio covers are available in panels. They are UV and heat resistant, ensuring your patios stay cool during summers while enabling them to last for many years. Since polycarbonate patio covers are clear and comes with glass-like appearance, they allow enough natural light to the patio area while minimizing glare. Bamboo patio covers are the made of woven bamboos that are interwoven with wire and comes in two types – split and matchstick. Form both the types, the split variety is the coarser, making it preferable for most installations. The matchstick variety is made from thin strips that are made from the bamboo stalk’s inner layer, is preferable if you want an overhead that are adjustable. Though it doesn’t appear nearly as often as wood, aluminum, canvas or fabric counterparts, the glass is still a perfectly viable material for a patio roof. This modern glass patio covering protects you from all of the elements except sunlight, so don’t forget your sunglasses and sunscreen! The modernity of this glass roof with the black frame (metal) can be creatively softened by green trellis that adds transition flawlessly into the lawn and pool! There you have it. A rundown of the various patio roof materials available in the market. You can relax and enjoy the extra living space on your patio around! Keep in mind you must consider your personal taste when selecting a cover material. Otherwise, you’ll end up with a patio you don’t want to spend your time on, despite spending a fortune on the project. By selecting the right patio roofing materials, you can enhance the beauty and living area of your house outdoor. Share you experiences with Gharpedia and give your comments in the below box. How to Make Your Own Terrace Garden – Step-By-Step Guide!